NEW! 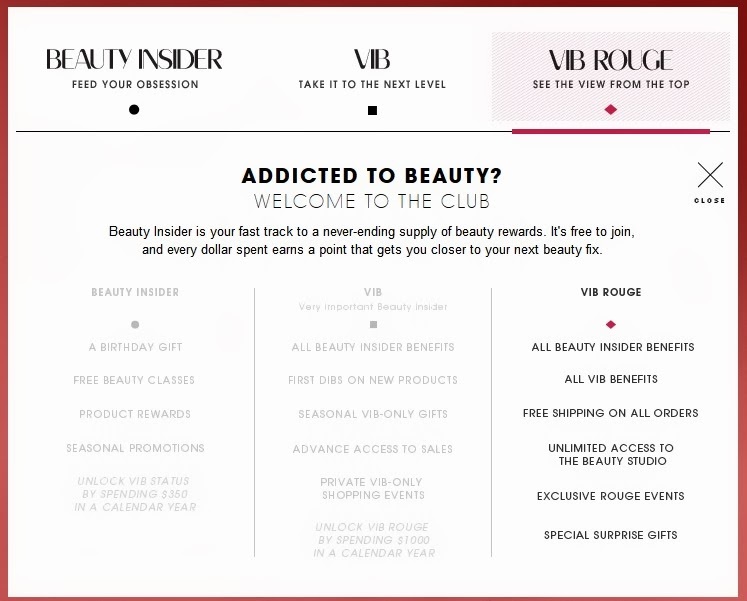 Spend a $1,000 in a calendar year to qualify for Sephora's new VIB ROUGE status. When I first heard about this concept of a VIB Rouge membership from my local Sephora I was really skeptical and thought for sure it was just a rumor. Then I saw on Twitter today, several people discussing this same thing. So I contacted a Sephora customer service rep and asked about the program. At first the Rep denied any knowledge of the program. When I pressed even further by offering up details she relented and stated that there is indeed such a program in the works. Just last week Sephora's Marketing department notified their Customer Service department about this new marketing ploy - VIB Rouge. The concept behind VIB Rouge is to encourage consumers to spend even more than the $350 threshold that is required for the regular VIB status. With VIB Rouge, if you spend at least a $1,000 or more in a calendar year you will receive all the perks of the regular VIB status, unlimited access to the beauty studio, free shipping on ALL orders, exclusive invites to Rouge Events, and special surprise gifts. Personally, I think this is a smart move on Sephora's part. This year I had managed to attain VIB Beauty status by April (read my post here) and I had stopped spending at Sephora. Instead, I had focused my efforts (and money) on Sephora's competitors beauty rewards programs. However, now I can redouble my efforts to try and attain VIB Rouge status at Sephora. So far this year I have spent about $641 so I still have a way to go but I'm pretty confident that I will be able to attain it. Even if I only qualify for one year it would still be nice to experience this status just to see what it is all about.